The Armed Services YMCA is thrilled to announce this year's Angel of Honor Award recipient is Gary Sinise. Sinise is well-known to the public as an actor, but to the military community he's considered a steadfast supporter and talented musician. Sinise has served the military community for more than 40 years and made a tremendous impact on active duty service members and veterans during that time. He has shown great commitment in providing gratitude, support, and service to the military community. The Angel of Honor Award is the highest award the Armed Services YMCA can confer, and is presented to an individual or organization demonstrating distinguished and extraordinary advancement of the Armed Services YMCA mission. Last year was the first time the Angel of Honor Award was bestowed. Country musician Lee Greenwood was the inaugural recipient. Recipients of the Angel of Honor Award must make contributions that extend and propel the mission of the Armed Services YMCA. This year, the ASYMCA Board of Directors selected Gary Sinise for his great advances in strengthening service members and their families. “Gary Sinise’s work in the military community resonates with our mission,” said William French Armed Services YMCA President & CEO. "We look forward to expanding on that work as we join together to honor these courageous military medics." The Angel of Honor Award is a bronze statue sculpted by Gareth Curtiss. Nationally acclaimed, Curtiss' work appears around the country. The ASYMCA is grateful for the donation of his extraordinary talent and time required to create this masterpiece. Gary Sinise’s support for service members has spanned decades. In the early 80s he was supporting Vietnam Veterans with Vet Nights, a program that offers free performances and dinners to veterans in Chicago. During the 90s he worked on behalf of the Disabled American Veterans organization, which he continues to do. Gary Sinise Foundation was formed in 2011. The mission of the foundation is to, "Serve and honor our nation’s defenders, veterans, first responders, their families and those in need by creating and supporting unique programs that entertain, educate, inspire, strengthen and build communities." The Gary Sinise Foundation supports not only the military, but all those who serve including first responders. The work done by the foundation is extensive and extremely impactful on the military and first responders communities. Projects by the Gary Sinise Foundation include everything from building specially adapted smart homes for America’s most severely wounded veterans to hosting day-long festivals at military medical centers to celebrate the courage of our heroes and their families during times of difficult rehabilitation. Sinise has traveled to visit troops In Afghanistan, Iraq, and other locations around the world. His band, the Gary Sinise and the Lt. Dan Band have performed all over from Alaska to Kuwait. They entertain troops by performing nearly 30 shows a year at military bases and fundraisers. 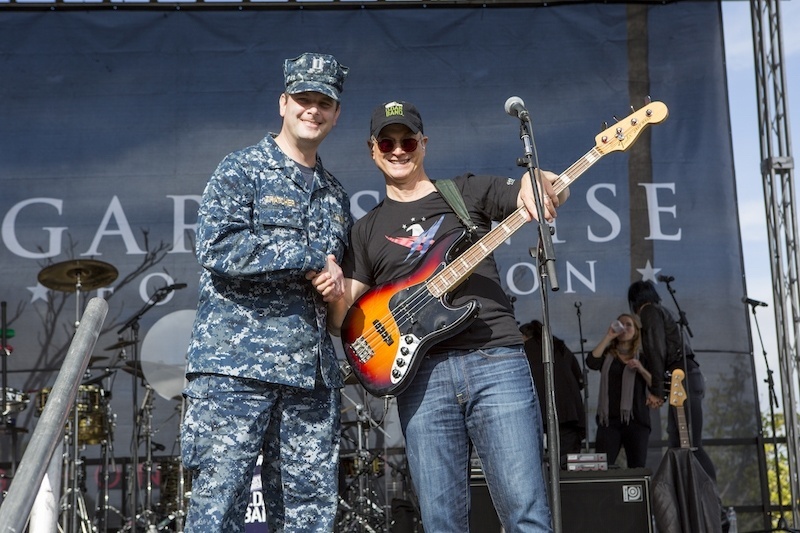 The Gary Sinise Foundation has nine outreach programs including R.I.S.E. (Restoring Independence Supporting Empowerment) which builds specially adapted smart homes for disabled veterans. Their Invincible Spirit Festivals are hosted at military medical centers to help boost morale. The Serving Heroes program provides classic, hearty American meals to service members across the country. And their most recent program, Soaring Valor sends WWII veterans to the museum built in their honor. For more information about the work the Gary Sinise Foundation does check out their website. Gary has gained the well-deserved recognition of numerous organizations over the years for his work in the military community. He received the second-highest civilian honor, the Presidential Citizens Medal in 2008. The Department of Defense presented him with the Spirit of Hope Award in 2012 and the Medal of Honor Society awarded him the Bob Hope Award for Excellence in Entertainment. And in October 2015, Gary received the Sylvanus Thayer Award from the West Point Association of Graduates. This award is given to a citizen whose outstanding character, accomplishments, and stature in the civilian community share comparative qualities for which West Point strives. As the work of the Gary Sinise Foundation continues to expand and deepen, his compassionate reputation does as well. The Armed Services YMCA is honored that Gary Sinise has accepted the Angel of Honor Award. His dedication and support of active duty service members and veterans is unmatched. We look forward to celebrating his benevolent work in the military community at the Angels of the Battlefield Awards Gala in November.